A New Year’s Perspective: Regardless of what you have been through, remember you cannot change the past but the choices you make each day defines your future. Keep your Vision of Hope! Fix your eyes on the Lord, the author and finisher of your faith. It’s amazing how much better we can see when we take a moment to pause, take a deep breath, pull aside, and get our focus. There are far too many external stresses and spiritual noise pollutants that can become distractions from our destinations. The world around us gets clouded at times. We need spiritual clarity and Holy Spirit headlights to get us through the fog. This coming year, may we all restore the Altar of Worship and find the Whoa, the Wow, and the Get Up & Go of God. In His Presence we get refreshed, re-focused, and re-fired. that His Word is True…in your life as it is in heaven. 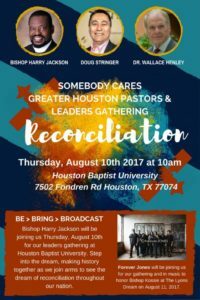 Thursday, August 10, 10am-12noon: Somebody Cares Houston Pastors & Leaders Meeting with Doug, Bishop Jackson, and Pastor Wallace Henley, Houston Baptist University. RSVP here. Friday, August 11, 7pm: The Lyons Dream. We honor Bishop Roy Kossie as a prophetic act of reconciliation in Houston’s Fifth Ward at Latter Day Deliverance Revival Church. RSVP here. Bishop Roy Kossie, a spiritual father and pioneer, a hero and champion, turned 85 on July 4. On August 11, we will gather to honor Bishop Kossie, also known as the Lion of Lyons Avenue, and to Re-dig the Wells for Revival in Houston’s Fifth Ward. This event, called The Lyons Dream, will mark the end of Reconciliation Week, a nation-wide call for the Church to join us in daily united prayers of reconciliation followed by tangibles expressions of Jesus. We who have been reconciled to God through Christ have now been given the ministry of reconciliation. The Heart Awakened Church can become united and bring healing and hope to a nation divided. Read more on the history Somebody Cares, Bishop Kossie, and The Lyons Dream; click here to view the Digging the Wells of Revival video from 1991. Leadership Awakening makes an impact! Doug has received invitations from ministers and business owners to teach on the topic to their staffs, and 26 leaders from ministry and the marketplace joined Doug and Tom Phillips from the Billy Graham Evangelistic Association for a three-day Leadership Awakening intensive at The Cove in Asheville, N.C. A ministry friend took books on a recent trip to Cambodia, where he says a group of leaders there was very blessed to receive them. In March, copies were distributed to all 181 Texas state legislators. Sales remain steady, too, as the Amazon.com Kindle version was ranked at 105 out of thousands of books in mid-May, and the hardcover copy has made it no. 124 in the rankings. To get your copy of Leadership Awakening, visit Amazon.com, BarnesAndNoble.com, or SomebodyCares.org. A young couple that is a faithful ministry partner felt led to give a sacrificial gift of $50,000 with anonymity as a Matching Challenge Gift from the sale of their home. With tears, they shared with Lisa and me that they really sensed how important all the ministries of Somebody Cares and TPMI are at this critical juncture in the world. We were stunned and humbled by their sacrifice and loving gesture! They themselves are involved in so much, have a young family, and are in ministry transitions. This truly is a sacrificial and amazing gesture of love and faith! Every dollar given by March 17–up to $50,000–will be matched 1 to 1! This is a great opportunity to leverage the impact of our ministry to bring healing, hope, and reconciliation to communities across the nation and around the world at a time when the Church needs to be a plumb line of righteousness and mercy. Click here now to double your donation, or you can send a check to: PO Box 925489, Houston, TX 77292. Please prayerfully consider supporting these important ministry efforts by helping us reach or exceed this matching challenge! As we become a mended net and are part of something so much bigger than ourselves, we will see God do amazing things in and through us! It’s hard to believe, but Doug Stringer, founder of TPMI and friend to many, will be 60 in just a few weeks. As a valuable ministry partner and friend, we invite you to join in the celebration! on-going prayers are of course welcomed! Pledging a monthly sustaining gift of $60 per month for the nextyear. Please email Alissa at the TPMI office to set up your monthly gift. “From Houston, Texas to the Four Corners of the World” through the preaching and teaching ministry. Likewise, you continue to sow into every life reached from the national and global outreach ministry of Somebody Cares. Would you partner with Doug once again? Along with Doug’s newly released book, Leadership Awakening, he will hostLeadership Awakening Intensives in 2017. Thank you for being a part of sowing into each life reached with the transforming message. May we experience a spiritual renewal and awakening across the land. This sentiment was communicated in various ways throughout the day on July 16 by volunteers, participants, and attendees who were all part of The Response USA, held at the Wolstein Center in downtown Cleveland. Thousands gathered as the church across Ohio crossed racial, denominational, and generational lines for a full day of worship, prayers of repentance, and intercession for our nation. Doug Stringer coordinated the gathering, along with a core team of volunteers and ministry leaders affiliated with TPMI and Somebody Cares. He reiterated that the day was not about political agendas or preachers coming to pontificate. Instead, the only name lifted up from the stage was the name of Jesus. This was the first Response that was not called and hosted by a state governor, as happened in Texas, Louisiana, South Carolina, North Carolina, and Florida. Yet leaders saw God’s hand in opening doors for the event to happen only days before Cleveland hosted the Republican National Convention, and in the days of unrest across the country following shootings of African American men in Louisiana and Minneapolis; terrorist acts in Orlando and throughout Europe; and a sniper taking the lives of five police officers in Dallas. A nervous tension could be felt as law enforcement officers from across the state moved into the city and began blocking streets and securing entire city blocks. But inside the Wolstein Center, believers from a diverse cross section of the church—“a coat of many colors”—prayed for peace and cried tears of repentance on behalf of our nation’s racial divides. Prayers went up on behalf of innocent blood that has been shed through senseless violence as well as abortion; for families to be healed; for honor and blessing between the generations; and for the church to be a conduit of reformation in all areas of our society. Interestingly, Ohio is the only state with a Bible scripture for its motto, “With God all things are possible” (Matthew 19:26). A volunteer serving backstage told us how he and five other men—some of them from other states—had been praying for The Response every Monday at 5:30am since January. During that time they saw God answer many personal prayers and had great anticipation that He would now hear their corporate prayers. When Dana’s daughter Allison was pregnant, she received a prophetic word that her baby would be born on a day when the Lord would usher in a new revival for the new generation. Her baby was born on April 9, the same day Azusa Now was held in Los Angeles and UnitedCry 2016 was held in Washington D.C. Doug Stringer was among those leading prayer at UnitedCry, and others from The Response Team attended the Azusa celebration. A few doors down, Allison knew a woman whose baby’s heart had stopped beating three days earlier and would be stillborn. As Allison, her husband, and her parents prayed and interceded, she sensed the Lord saying the baby’s life would be restored as the baby was lying on the mother’s chest. When the baby was born that day at 11:59pm, the medical personnel cleaned the child up and placed the lifeless body on its mother’s chest. Just as Allison had heard, the baby began to breathe and is alive and healthy today. Dana believes God gave two promises that day: first, through the sign of a new revival with the birth of his granddaughter; then a message that the Church would be revived as we press in to Him. The Response, he believes, is a significant part of what God is doing. “A church united can heal the soul of a nation divided,” Doug Stringer said in a pre-Response interview. Reports coming out of Cleveland in the week that followed The Response seemed to confirm this statement, as the violence, arrests, and illegal activities turned out to be incredibly less than anticipated. This November-December will mark 20 years since we held Prayer Mountain, a time when the Church of Houston set aside racial, denominational, and generational differences to lift up the name of Jesus through 40 days of prayer and worship. We saw many miracles happen during that time, from changed hearts to healed bodies to mended relationships. If you were a part of Prayer Mountain, use the comments section below to tell us how it impacted your life! This year marks the 15th year anniversary of Ad Deum Dance Company as a full time professional dance organization. Ad Deum is a professional modern/contemporary dance company based in Houston, Texas, directed by its founder Randall Flinn, who established the company in January 2000. Dancers have come to Ad Deum from around the world seeking to be connected with a community of artists that share a common vision and desire. Randy, who holds the distinction of being the “first Turning Pointer,” gave his life to Jesus in 1981 after Doug Stringer allowed Randy to use his exercise studio for his dance group’s rehearsals. Recognized nationally and internationally, Randy founded Ad Deum with the mission to create and perform excellent and vital works of dance that serve to wash over the heart and soul of humanity with relevant meaning and redemptive hope. In 15 years, Randy says, that mission has never changed. Ad Deum has toured across the USA, Canada, Mexico, Europe, and Asia. Their work has been featured in Dance Spirit and Dance Magazine and they have received outstanding reviews of their performances worldwide. For more information, visit www.danceaddeum.com.